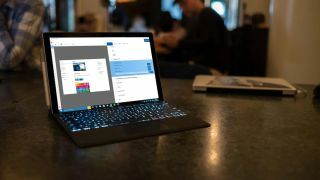 Microsoft has pushed out a new preview build for Windows 10, which marks the transition of the Fall Creators Update to being set in stone, ahead of its rollout in two weeks. The company has released Windows Insider build 16299.15 to the Fast Ring last night, which is, as Winsupersite reports, essentially the same as version 16299. Very minor changes, like removing the watermark on the desktop, and the lack of a build expiration date, are about its only differentiators. Going forward, Dona Sarkar (head of the Windows Insider Program at Microsoft) noted that this build will be serviced via cumulative updates delivered by Windows Update, and there won’t be any more new builds delivered (just tweaks to this one). As everything is now finished, this is, effectively, what’s known as the RTM (release to manufacturing – the final build vendors can preinstall on hardware) version of the Fall Creators Update, all but for the fact that Microsoft hasn’t officially announced that just yet. With the Fall Creators Update now finalized, all that’ll be coming down the cumulative update pipeline will be bug fixes – and hopefully not too many of them at this point. As mentioned, the Fall Creators Update is unleashed on October 17, and testers will be shifted over to Redstone 4, the next major upgrade in the pipeline due to release next year.